Update 08/10/2014: HP support recommends to install the following versions of the Emulex firmware/drivers. You can read more about the issues here at http://www.techazine.com. I saw the same symptoms on brand new HP BL460 Gen8 and vSphere 5.1 update 2, the latest build: VMware-ESXi-5.1.0-Update2-2000251-HP-5.68.30-Sep2014.iso released on 2014-09-08. Hosts randomly disconnects from vCenter, even if those hosts are in maintenance mode (lucky me). To solve this issue, you need to downgrade the driver to the previous version. I had no issues with the 4.6.247.10 drivers so I used this one. I created a PowerCLI script to verify the installed version of the net-be2net on all the BL460c Gen8 blades. Now we wait for a fix from HP and Emulex. 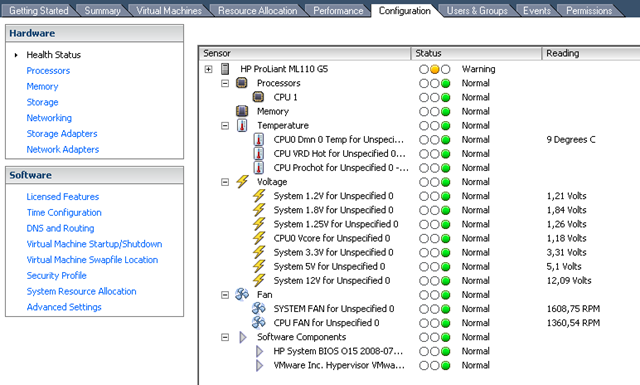 This entry was posted in VMware and tagged Drivers, Emulex, HP, PowerCLI on October 1, 2014 by afokkema. Robert van den Nieuwendijk created the basis of this script and shared it on the VMware Communities. The problem I had with the original script was the default SSL certificate which HP uses on the iLO adapters. This resulted in an error and the script failed to return the XML file. So I started a search query on Google and found a post by Paul Brice who had the same problem while getting information via XML on an Iron Port setup. I tried his code to open the iLO XML information and it worked like a charm. So I updated the script from Robert and added the information from Paul to it. The last thing I changed was the $url and added a RegEx to return the digits from the ESX hostname. For example esx72, the RegEx will return the 72. The output of the script will be exported to a CSV file. This entry was posted in Powershell and tagged HP, iLO, PowerCLI on September 26, 2011 by afokkema. Toen ik de eerste keer de cd erin stopte van 3.5 werd de originele disk herkend als een IDE disk en wilde ESX alles EXT 3 maken. Ik dacht uit m’n hoofd dat de SATA controller toen in de BIOS aangevinkt stond als AUTO. Ik heb toen deze optie omgezet naar SATA. CD opnieuw erin en installatie gestart, de HD werd nu herkend als SCSI disk en zo werd het mogelijk om een VMFS aan te maken. This entry was posted in Hardware, Virtualization, VMware and tagged ESX 3.5, ESX 3i, HP, VMware on August 4, 2008 by afokkema. Sinds afgelopen vrijdag heb ik deze server in mijn bezig en tot nu toe ben ik er uitermate tevreden over. Ik heb deze server gelijk voorzien van 8GB RAM en een extra 750GB harddisk. Vaste schijfcontroller: HP geïntegreerde zes-poorts SATA-controller met geïntegreerd RAID. Beheerkenmerken: Embedded Lights Out 100 IPMI 2.0 standaard rapportage. This entry was posted in Hardware and tagged HP on August 4, 2008 by afokkema.